Vivo iQOO 12 GB RAM + 128 GB Storage New Variant Introduced - Playfuldroid! At the beginning of the previous month, Vivo had introduced the Vivo iQOO gaming smartphone in multiple RAM and storage editions. The Monster version of the phone comes with 12 GB of RAM and 256 GB of storage. It carries a price tag of 4,298 Yuan ($640). The Chinese firm has today announced a new 12 GB RAM variant of the phone. It comes with 128 GB of native storage. The Vivo iQOO 12 GB RAM + 128 GB storage variant comes in Opto-electric Blue option. It is priced at 3,698 Yuan ($550). On April 14, the Chinese manufacturer will carry out the reservations of the smartphone. The new variant comes with the specs like other editions of the phone. The Vivo iQOO base model comes with 6 GB of RAM and 128 GB of storage. It is priced at 2,998 Yuan ($446). It is the only model that comes with 22.5W charging. The remaining models including the one that has been announced today comes with 44W rapid charging. 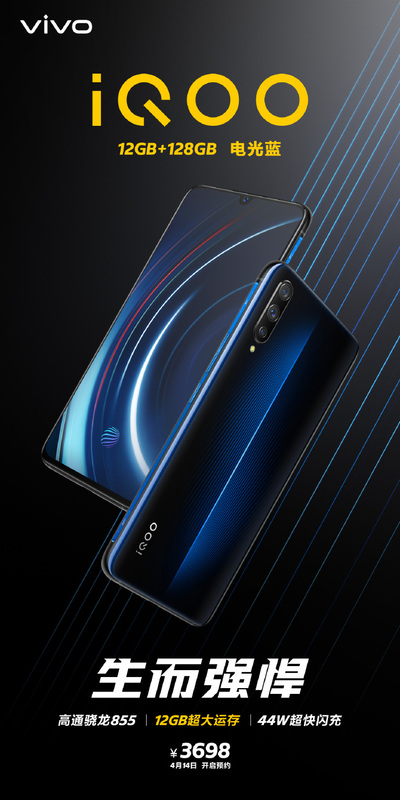 The other iQOO variants such as 8 GB RAM + 128 GB storage, 8 GB RAM + 256 GB storage are respectively priced at 3,298 Yuan ($490) and 3,598 Yuan ($535). The Vivo iQOO phone comes with 6.4-inch AMOLED full HD+ display with waterdrop notch and in-screen fingerprint reader. I tis equipped with 12-megapixel + 13-megapixel + 2-megapixel triple camera and 12-megapixel front camera. The smartphone includes a 4,000mAh battery.